and Riding Hood performed a striptease for the wolf. believing her hairy grandma must be innocent. as determined I would never wear the colour red. 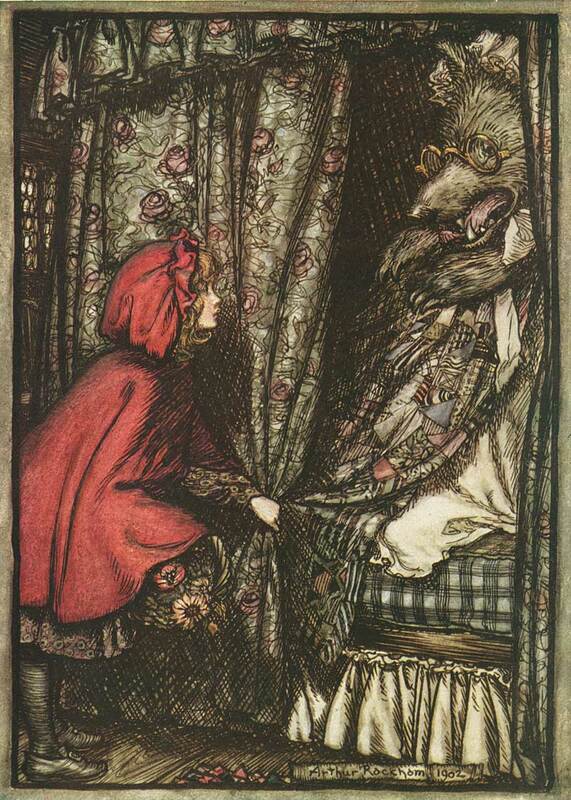 I still blush red, innocent and enthralled by a fairy tale wolf. It does not have a required meter, but it is generally thought that tritina should have a consistent meter or rhythm throughout to emphasize the repetition and musical-refrain quality of the verse. The single end line is a conclusion, so tritina can be similar to a sonnet in that a turn can happen between lines 9 and 10. Marian has shared an example by David Yezzi: ‘Tritina for Susannah’ as well as one by Marie Ponsot, ‘Roundstone Cove’. My poem was inspired by Thursday’s un-fairytale prompt. Posted in Poems about Fairy Tales. Tagged Fussy Little Forms, Imaginary Garden with Real Toads, Little Red Riding Hood, Tritina. Previous: Previous post: Peeking Cat Anthology 2018 Out Now! I smile a little here in the quiet night. My mind was not towards Riding Hood but rather on that innocent grandmother. Grandmas are not always innocent, just dig through the writings and drawings they’ve left behind. Good on the form, loved the poem and what’s hidden. Great use of those three signature words to tell the tale.. good moral lesson at the end. Ahhh… this is terrific. The repeating words not so perceptible as I read, because I was enthralled with what you are saying. That is a good thing in my book! The red as a warning… maybe it was put there to make children cautious of being vain… for sure it helped in your case 🙂 The worst part of the red has to be those red shoes though. Warning! Warning! Danger! I agree. Colors did have significance in tales. I lived the doing a striptease for the wolf. I never thought of that. Apparently there are quite a lot of different versions but in the original one the wolf made her take her clothes off and get into bed with him! So it looks like a few of us went with Riding Hood. I love your use of red, and the strip tease. Love this Kim- you nailed the form! I just love this! It’s perfect in every way.